Have you ever had a moment with a car? Just a brief couple of minutes in which you fell positively, uncontrollably head over heals for an automobile? 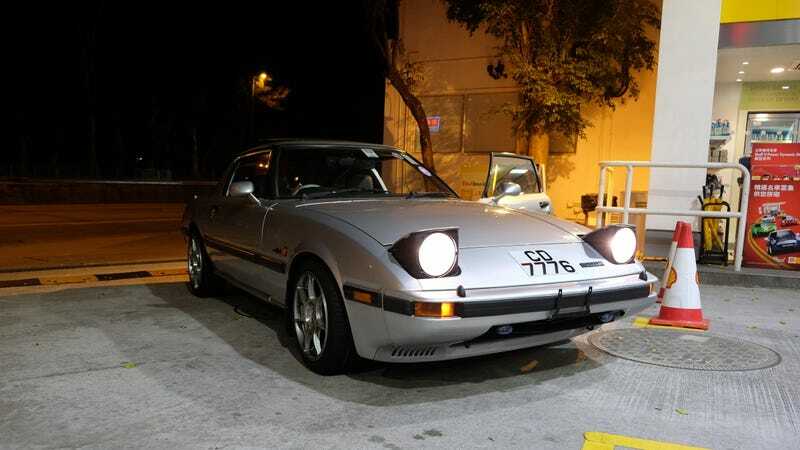 I did one night in Hong Kong a while back, and now I can’t stop thinking about first-generation Mazda RX-7s. Last Christmas, I flew to Hong Kong to visit my brother Mike, a geologist working in the rocky Special Administrative Region of China. On the flight over, and throughout the trip, I learned a lot about Japanese car culture by reading Ben Hsu’s book Classic Japanese Performance Cars. One of my favorite chapters talked about how 47 engineers at a little former-cork company in Japan turned the quirky and troublesome rotary engine into something truly majestic. I am, of course, talking about Mazda, and one of the cars that brought the company into the hallowed halls of true automotive giants was the original RX-7. Reading about the incredible history of the Japanese auto scene while simultaneously walking through Hong Kong and witnessing some of the most priceless gems I was reading about was a life-changing experience. I was seeing Mitsubishi Pajero Evolutions, Nissan Fairlady Zs, Skyline GT-Rs, classic Toyota Celicas, Nissan Pulsar GTI-Rs and a whole lot of other things that really enhanced my appreciation for Japanese car culture. But it was on the final night of my trip, as my brother and I headed towards the river to go fishing, that we spotted something that truly moved me. It was a first-gen RX-7 idling in front of a gas station.